I recently came across a highly disturbing news item in the Khaleej Times today and promptly dispatched a letter to the editor about the same. 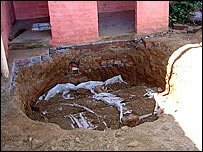 The news item described the discovery of about 25 aborted foetuses in a well near a clinic in the state of Punjab in India. Its a clear cut case of selective abortion and female infanticide. A lady along with her two daughters came to me asking (for some alms), but she found nothing with me except one date which I gave to her and she divided it between her two daughters, and did not eat anything herself, and then she got up and went away. Then the Prophet came in and I informed him about this story. He said, "Whoever is put to trial by these daughters and he treats them generously (with benevolence) then these daughters will act as a shield for him from Hell-Fire." One must appreciate the exalted status that Islam has given to women even before they are born. Allegations against Islam of female suppression and male dominance smack of ignorance or prejudice or both. Posted by Arshad on Sunday, August 13, 2006.